Grumpyface Studios: Teeny Titans v1.1 Free Content Update is here! 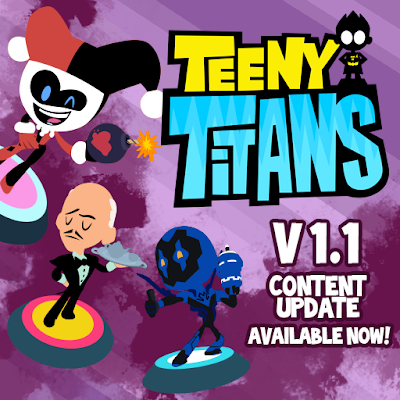 Teeny Titans v1.1 Free Content Update is here! - 7 New Figures to collect including Harley Quinn, Blue Beetle, and even Alfred! - NEW CHALLENGE MODE! Visit the Justice League Recruitment Center today to see if you have what it takes to join the world’s most renowned super team! Rank up and earn exclusive figs! - New side missions, new game-wide balance tweaks and tuning improvements, new achievements, and more! For full patch notes, check out our Tumblr blog! You can grab the update on the iOS App Store, for Android on Google Play Games, or on Amazon Kindle! The game is very easy to pass, please add more missions and characters! Please make this game longer. And please more games. Love your games. Hello just wanna ask when is the next update, im excited to see more characters game mode and challenges, hope to see more villains and heroes specially mas and menos.. I'd also love to see a Google Play or cross-platform save integration. My son and I live this game and really hope to see more. My favorite game... I am looking for next updates. Any chance of bringing to Switch and add more support?